For a young sports reporter, still cutting his teeth in journalism, the prospect of covering the 1994 San Marino Grand Prix seemed like a dream assignment. While not as revered as Monaco, the San Marino race was always an iconic event for Formula One fans because of its links to Ferrari. In the days leading up to the race there was a festive atmosphere at the circuit, with the stands filled with thousands of fans waving the famous prancing horse flags. It seemed a wonderful place to be. There was an air of excitement in the press room as well but the media were aroused by a storm that was brewing. 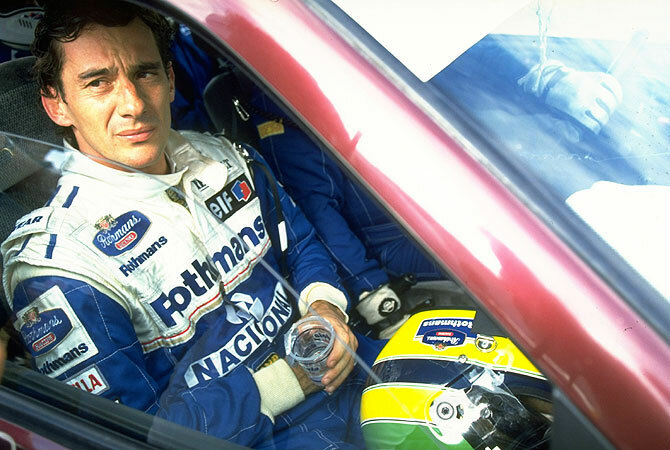 Ayrton Senna was the favourite to win the championship but things were not going as planned for the Brazilian. He had failed to finish the first two races of the season, which were both won by Michael Schumacher. Senna was surprised by the speed and reliability of Schumacher's Benetton and was questioning the legality of the German's car. His suspicions had attracted the interest of the media and the paddock, the area behind the team garages where reporters congregate to speak with drivers and their teams, was thick with gossip and innuendo. 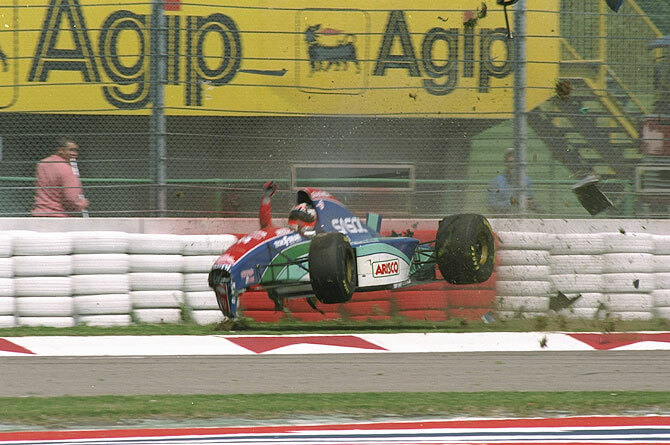 But everyone's attention took a sudden and ominous diversion during the Friday qualifying session when Rubens Barrichello was involved in a horrific crash. The Brazilian's car was launched into the air after he clipped a kerb and hit the fence with tremendous force. 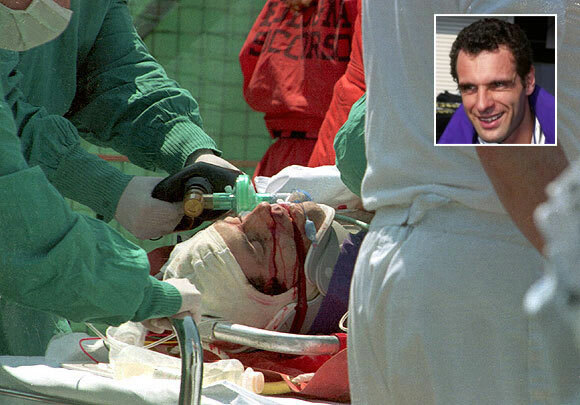 Barrichello was knocked unconscious in the impact and swallowed his tongue. In the media centre, one female reporter screamed, as everyone in the room rushed back to their seats to watch replays of the incident. "He's dead," one journalist proclaimed. "Yes," another nodded. In 1994, the internet had still not been commercialised and there were no live blogs or tweets so reporters began relaying news of the accident the old fashioned way: calling their desk editors on the phones and tapping out their stories on the chunky portable computers of the day. The initial details were sketchy. 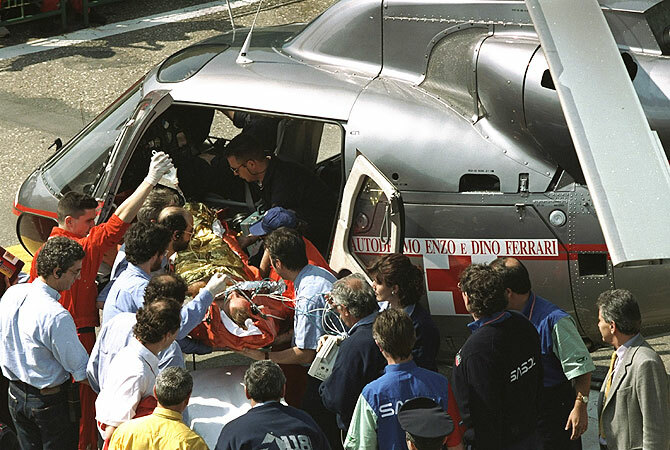 Barrichello had been examined at the circuit but was transferred to a nearby hospital. There were no further details on his condition so everyone feared the worst. For me, that meant writing Barrichello's obituary -- a grisly but routine procedure when a famous sportsmen's life is in danger. Mercifully, the obituary was never published. A few hours after the crash there was a sudden commotion at the entrance to the media centre as Barrichello walked in. With his arms raised in the air, he announced his arrival with a triumphant "hey." He had a small dressing across the bridge of his nose and had been ordered not to race that weekend but was otherwise fine. There was a collective sigh of relief in the press room before the media went into overdrive. The story had already changed. The new angle was the impenetrable safety of Formula One cars. It had been more than a decade since a driver had been killed on a race weekend -- by far the longest span without a death since F1 began in 1950 -- and Barrichello's crash was the ultimate proof that the sport was safer than ever. 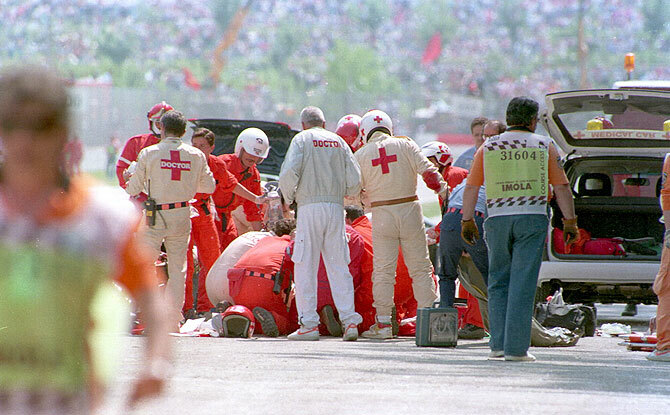 Later that night, it was the main topic of conversation over drinks in every bar in Imola and everyone went to bed in the belief that everything was fine. When the Austrian rookie Roland Ratzenberger crashed during Saturday's qualifying session, no-one shrieked or suspected the worst. 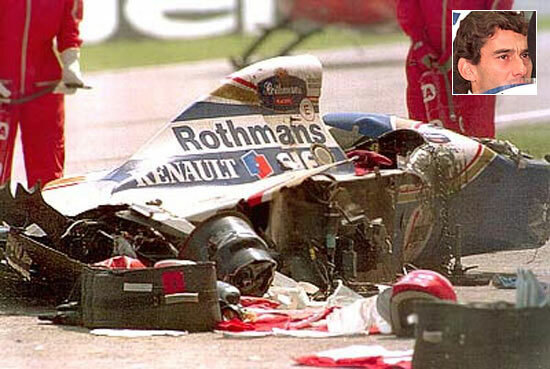 He had been travelling faster than Barrichello when he drove head-on to a concrete wall but his car was largely intact. The session was halted and I filed the news bulletins that the session had been stopped because of another accident but there was no real inkling of the severity of his condition until hours later when an FIA spokesman walked into the news room and read a brief statement saying Ratzenberger had died from his injuries. It was like a bomb went off in the press room and everyone exploded into activity. Reservations for dinner that night were cancelled and the media centre was engulfed with cigarette smoke and the smell of coffee as everyone rushed to meet their deadlines. What had seemed like a fun, plum gig had quickly turned into a major news event and the pressure was on. The press arrived en masse earlier than usual on the day of the race, chasing more news and reaction to Ratzenberger's death but there was little talk in the paddock. Normally bursting with excitement on race day, the breakfast tables outside the team garages were mostly silent because of the pall that had been cast. Everyone wanted to question Senna about Ratzenberger. He had been visibly upset by the crash and refused to rejoin Saturday's qualifying session when it recommenced but he was not talking to the press. There was an eerie feeling before the race that something was not right. Two of the spots on the grid were vacant and everyone was on edge. I called my desk editor and we decided to keep the phone line open for the whole race. Like most reporters, I went to the large window overlooking pit lane to watch the start before retreating to my seat to follow the race on the television monitors. My eyes were trained on Senna, who was on pole position, but when he made a clean getaway I was immediately drawn to a car further down the grid. JJ Lehto had stalled his Benetton and could not move. I watched as he ducked his head and waited for the inevitable shunt. Drivers behind him instinctively swerved to avoid him but the further back they were on the grid, the faster they were travelling when they eventually saw his stationary car. Pedro Lamy was the unlucky driver who hit him. He started 22nd on the grid and it was too late by the time he spotted Lehto. He smashed into the back of him, showering the track and the stands with wreckage. Of the four crashes that weekend, it was the only one I saw with my own eyes and it was not a pretty sight. A handful of spectators were injured by debris and the safety car was deployed as I scrambled back to my desk to speak to my editor. 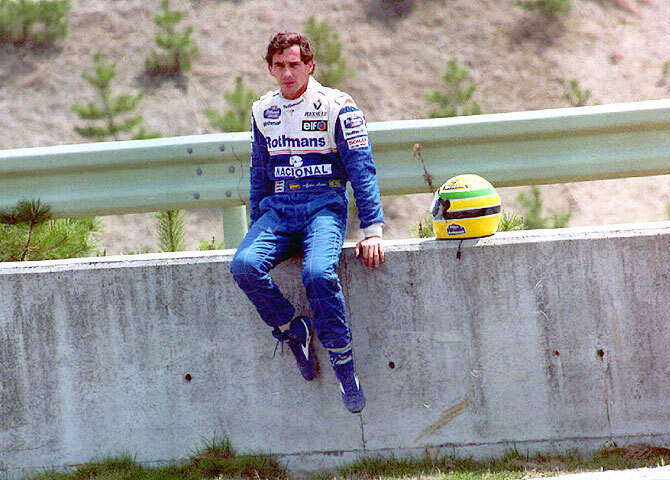 Senna completed just six laps before his fatal crash, which I watched on television with the phone to my ear. At the moment of impact, both my editor and I spontaneously blurted out the same salty expletive before lunging into our filing routine for major stories, which involved an instant bulletin followed by a series of updated and expanded stories. The rest of the race was a blur that few people remember let alone care what happened. Schumacher won but there were no wild celebrations that night. Some of the public relations officers that hand out each team's notes after races were wearing dark sunglasses to cover their tears but the press room was a hive of activity. Every reporter in the room knew this was the biggest Formula One story they would probably cover in their lives so there was no time for idle chit-chat. Older reporters were dictating their stories over the phone to copytakers while the younger cubs were banging away on their laptops. The time flew by. It was almost 3am when I finally stopped working but it seemed much earlier. The room was still half full but the circuit was in darkness and the last trains had stopped running. I hailed a taxi to take me back to my hotel in Bologna, about 50 kilometres away. When I arrived at my hotel, the receptionist was crying. I asked her what was wrong but she didn't speak English and I didn't speak Italian so she pointed to the first edition newspaper that had arrived. 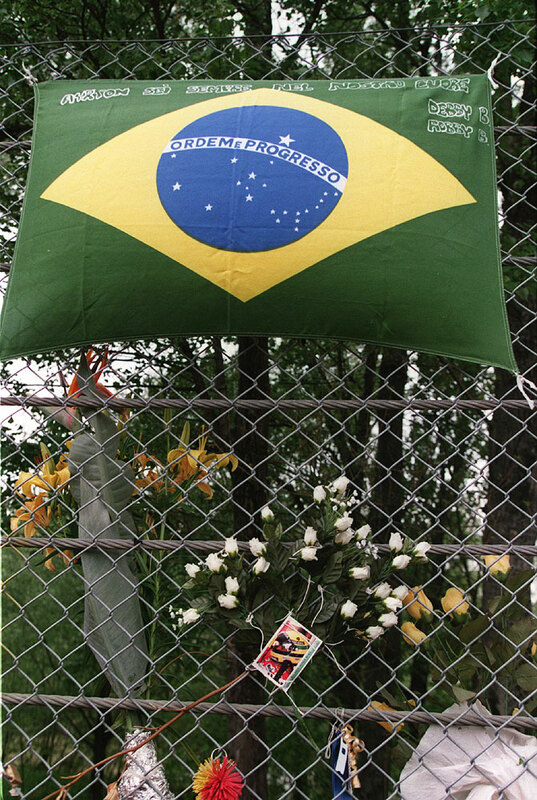 The front page simply read: "Senna è morto."